My robots paint with dozens of AI algorithms all constantly fighting for control. I imagine that our own brains are similar and often think of Minsky's Society of Minds. Where he theorizes our brains are not one mind, but many, all working with, for, and against each other. This has always been an interesting concept and model for creativity for me. Much of my art is trying to create this mish mosh of creative capsules all fighting against one another for control of an artificially creative process. Some of my robots' creative capsules are traditional AI. They use k-means clustering for palette reduction, viola-jones for facial recognition, hough lines to help plan stroke paths, among many others. On top of that there are some algorithms that I have written myself to do things like try to measure beauty and create unique compositions. But the really interesting stuff that I am working with uses neural networks. And the more I use neural networks, the more I see parallels between how these artificial neurons generate images and how my own imagination does. Recently I have seen an interesting similarity between how a specific type of neural network called a Generative Adversarial Network (GAN) imagines unique faces compared to how my own mind does. Working and experimenting with it, I am coming closer and closer to thinking that this algorithm might just be a part of the initial phases of imagination, the first sparks of creativity. Full disclosure before I go on, I say this as an artist exploring artificial creativity. So please regard any parallels I find as an artist's take on the subject. What exactly is happening in our minds would fall under the expertise of a neuroscientist and modeling what is happening falls in the realm of computational neuroscience, both of which I dabble in, but am by no means an expert. Now that I have made clear my level of expertise (or lack thereof), there is actually an interesting thought experiment that I have come up with that helps illustrate the similarities I am seeing between how we imagine faces compared to how GANs do. For this thought experiment I am going to ask you to imagine a familiar face, then I am going to ask you to get creative and imagine an unfamiliar face. I will then show you how GANs "imagine" faces. You will then be able to compare what went on in your own head with what went on in the artificial neural network and decide for yourself if there are any similarities. So the first simple mental task is to imagine the face of a loved one. Clear your mind and imagine a blank black space. Now pull an image of your loved out of the darkness until you can imagine a picture of them in your mind's eye. Take a mental snapshot. The second task is to do the exact same thing, but by imagining someone you have never seen before. This is the creative twist. I want you to try to imagine a face you have never seen. Once again begin by clearing your mind until there is nothing. Then out of the darkness try to pull up an image of someone you have never seen before. Take a second mental snapshot. This may have seemed harder, but we do it all the time when we do things like imagine what the characters of a novel might look like, or when we imagine the face of someone we talk to on the phone with, but have yet to meet. We are somehow generating these images in our mind, though it is not clear how because it happens so fast. So now that you have tried to imagine an unfamiliar face, it is neat to see how neural networks try to do this. One of the most interesting methods involves the GANs I have been telling you about. GANs are actually two neural nets competing against one another, in this case to create images of unique faces from nothing. But before I can explain how two neural nets can imagine a face, I probably have to give a quick primer on what exactly a neural net is. The simplest way to think about an artificial neural network is to compare it to our brain activity. The following images show actual footage of live neuronal activity in our brain (left) compared to numbers cascading through an artificial neural network (right). Our brains are a collection of more than a billion neurons with trillions of synapses. The firing of the neurons seen in the image on the left and the cascading of electrical impulses between them is basically responsible for everything we experience, every pattern we notice, and every prediction our brain makes. The small artificial neural networks shown on the right is a mathematical model of this brain activity. To be clear it is not a model of all brain activity, that is computational neuroscience and much more complex, but it is a simple model of at least one type of brain activity. This artificial neural network in particular, is small collection of 50 artificial neurons with 268 artificial synapses where each artificial neuron is a mathematical function and each artificial synapses is a weighted value. These neural nets simulate neuronal activity by sending numbers through the matrix of connections converting one set of numbers to another. These numbers cascade through the artificial neural net similarly to how electrical impulses cascade through our minds. In the animation on the right, instead of showing the numbers cascading, I have shown the nodes and edges lighting up and when the numbers are represented like this, one can see the similarities between live neuronal activity and artificial neural networks. While it may seem abstract to think how this could work, the following graphic shows one if its popular applications. In this convolutional neural network an image is converted into pixel values, these numbers then enter the artificial neural network on one side, go through a lot of linear algebra, and eventually comes out the other side as a classification. In this example, an image of a bridge is identified as a bridge with 65% certainty. With this quick neural network primer, it is now interesting to go into more details of a face creating Generative Adversarial Network, which is two opposing neural nets. When these neural nets are configured just right, they can be pretty creative. Furthermore, closely examining how they work, I can't help but wonder if some structure similar to them is in our minds at the very beginning of when we try to imagine unfamiliar faces. So here is how these adversarial neural nets fight against each other to generate faces from nothing. 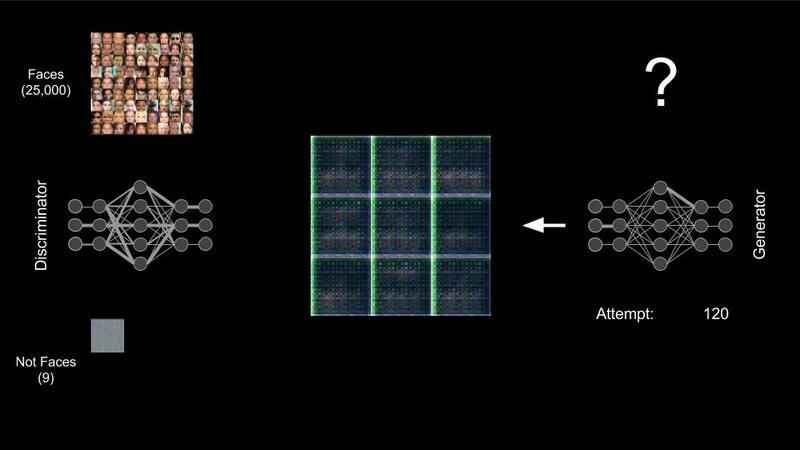 The first of the two neural nets is called a Discriminator and it has been shown thousands of faces and understands the patterns found in typical faces. This neural net would master the first simple mental task I gave you. Same as how you could pull the face of a loved one into your imagination, this neural net knows what thousands of faces looks like. Perhaps more importantly, however, when shown a new image, it can tell you whether or not that image is a face. This is the Discriminator's most important task in a GAN. It can discriminate between images of faces and images that are not faces, and also give some hints as to why it made that determination. The second neural nets in a GAN is called a Generator. And while the Discriminator knows what thousands of faces looks like, this Generator is dumb as a bag of hammers. It doesn't know anything. It begins as a matrix of completely random numbers. So here they are at the very beginning of the process ready to start imagining faces. First thing that happens is the Generator guesses at what a face looks like and asks the Discriminator if it thinks the image is a faces or not. But remember the Generator is completely naive and filled with random weights, so it begins by creating an image of random junk. When determining whether or not this is a face, the Discriminator is obviously not fooled. The image looks nothing like faces. So it tells the Generator that the image looks nothing like faces, but at the same time give some hints about how to makes its next attempt a little more facelike. This is one of the really important steps. Beyond just telling the Generator that it failed to make a face, the Discriminator is also telling it what parts of the image worked, and the Generator is taking this input and changing itself before making the next attempt. After 4,000 attempts, rejections, and corrections from the Discriminator, the Generator actually gets pretty good at making some pretty convincing faces. Here is an animation from the very first attempt to the 4,000th iteration in 10 seconds. Keep in mind that the Generator has never seen or been shown a face. So How Does this Compare to How We Imagined Faces? Early on we did the thought experiment and I told you that there would be similarities between how this GAN imagined faces and you did. Well hopefully the above animation is not how you imagined an unfamiliar faces. If it was, well, you are probably a robot. Humans don't think like this, at least I don't. But let's slow things down and look at what happened with the early guessing (between the Generators 180th and 400th attempts). This animation starts with darkness as nondescript faces slowly bubble out of nothing. They merge into one another, never taking on a full identity. I am not saying that this was the entirety of my creative process. Nor am I saying this is how the human brain generates images, though I am curious what a neuroscientist would think about this. But when I tried to imagine an unfamiliar face, I cleared my mind and an image appeared from nothing. Even though it happens fast and I can not figure out the mechanisms doing it, it has to start forming from something. This leads me to wonder if a GAN or some similar structure in my mind began by comparing random thoughts in one part of my mind to my memory of how all my friends look in another part. I wonder if from this comparison my brain was able to bring an image out of nothing and into vague blurry fog, just like in this animation. I think this is the third time that I am making the disclaimer that I am not a neuroscientist and do not know what exactly is happening in my mind. I wonder if any neuroscientist does actually. But I do know that our brains, like my painting robots, have many different ways of performing tasks and being creative. GANs are by no means the only way, or even the most important part of artificial creativity, but looking at it as an artist, it is a convincing model for how imagination might be getting its first sparks of inspiration. This model applies to all manner of creative tasks beyond painting. It might be how we first start imagining a new tune, or even come up with a new poem. We start with base knowledge, try to come up with random creative thoughts, compare those to our base knowledge, and adjust as needed over and over again. Isn't this creativity? And if this is creativity, GANs are an interesting model of the very first steps.